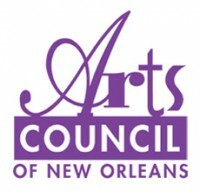 The Arts Council of New Orleans is a multifaceted organization that benefits both artists and fans of the arts. In addition to distributing state arts funds and implementing the city’s Percent for Art and other programs, it offers seminars, workshops and legal assistance to artists and sponsors the monthly Arts Market in Palmer Park. There is also the popular NOLA Fun Guide, featuring entertainment listings and half-price ticket offers. Each of these endeavors strengthens the local arts community and its ties to the city. Mary Len Costa, interim executive director of the Arts Council, grew up in what you might call an artistic “community”—her family. “I’m the youngest of nine children, and we grew up with three pianos in our house,” she explains. “We were always studying voice and music. We had one room where we had blackboards on all four walls, and I would draw there constantly.” At college in her hometown of Memphis, Costa studied textile design and weaving; she has worked as a sculptor and ceramist as well. When Costa moved to New Orleans in the early 1970s, she began working in the nonprofit world, fundraising for Audubon Institute and working with the Coliseum Square Association, which supports the renovation and rejuvenation of the Lower Garden District, where she lives. Through these projects, she says, “I did a lot of community building, working with governmental agencies, learning how things get done. That gave me the foundation to go into the public arts field.” She joined the Arts Council as director of public arts, a position she held for 10 years, and in 2007, she took over as interim executive director. During her tenure, she’s been quite productive helping the creative community rebuild after the storm and endure these challenging economic times. What has the transition from public arts director to executive director been like? I’d already worked side by side with my co-workers for 10 years, so there hasn’t been a strong change. We’re all working together. It’s still very much a team. Everyone has the right to have a voice and bring their expertise to the table. It’s a very collaborative office. Through seminars, webinars and other projects, your business program helps artists market and protect their work. Can you talk a little about the Arts Market, which also evolved out of the business program? The Arts Market is held in Palmer Park the last Saturday of every month. There are about 100 to 150 [artists] there on a regular basis. Some artists sell their work almost entirely at our market, other markets and online, and they do quite well. What kind of legal support does the Arts Council of New Orleans provide to artists? We help artists all the way to the resolution of their legal issues, including copyrights and trademarks. Since the storm a lot of artists have formed cooperatives and opened galleries, and we help them decide whether to structure themselves as a corporation or a partnership. We’ve helped with insurance claims. And we’ve helped around two dozen musicians get their credit and paperwork in order for them to qualify for residency in the Musicians’ Village. It’s pretty monumental to realize you can help them with their home ownership. Tell me about the NOLA Fun Guide. It’s our online calendar of cultural events that are happening in the community. We started it to help artists rebuild their audience after Katrina. It has evolved since then and now offers half-price tickets to events put on by participating organizations. People sign up for free and receive e-mail announcements on Wednesdays letting them know what offers are available. You recently received a $250,000 National Endowment for the Arts grant, which you’ll use to enable local arts organizations to retain their staff despite the economic downturn. The NEA program, the American Recovery and Retention Act of 2009, provides one-time grants to organizations throughout the country. About 13 Louisiana organizations have received grants, totaling over $1.1 million. It’s great because with around $3 million cut in the state budget for the arts this year, we don’t know what we’re going to be getting from the state. How has the Arts Council helped artists in the aftermath of Katrina? After Katrina, we got an NEA grant to bring in nationally recognized arts marketers to work with all our arts organizations. The sessions taught the parties how to market, maintain your old audience and build a new audience. With the Joan Mitchell Foundation’s New Orleans Career Opportunity grants, we’ve been able to help local artists rebuild their studios and put their artwork in public spaces so they can start rebuilding their careers. The pieces will stay up for two years, and then if the neighborhoods like them they can keep them. How important are the arts to the city’s post-Katrina comeback? I can’t imagine New Orleans without the arts. That is one of the reasons that I came here in the first place. We are an incredibly creative community, full of creative people. We have a lot of individual artists, but also a lot of neighborhood-based, grassroots organizations that are creative. When I first came back, I realized how quiet it was. Then one day I heard someone out in Coliseum Square playing a horn. We all went flying out of the house to find out who it was, who was making music. It was like hearing your first bird, and it was wonderful.